The Countdown2Extinction Yahoo! Widget was created as a constant reminder that the species of our world are in peril. An easy to use yet powerful time tracker widget. When it is minimized, it will start and stop tracking time at a click of a button. When expanded, it offers some advanced features such as managing multiple projects and tasks. A desktop Widget for Tickspot time tracking online application. Tools: Yahoo! Widgets Engine and Photoshop. The Widget accesses Dragonfly's web services in order to create and manage a slideshow. Tools: Yahoo! Widgets Engine, Photoshop and Charles to debug the web service requests. A countdown timer with support for multiple skins, customizable fonts and alarms. The Canoe Is the People honours and explores the knowledge and skills of traditional Pacific navigation through videos and Flash animations. It is designed for Pacific youth. Role: Implemented the Maori version of the CD-ROM; Built a custom installer using Adobe Director for the Mac version; Designed a custom Maori font (based on Arial) using Fontlab Studio. Tools: Adobe Director for the main application and the Mac installer; Quicktime for video editing and compression; Adobe Flash to edit some of the embedded animations; Adobe Photoshop. 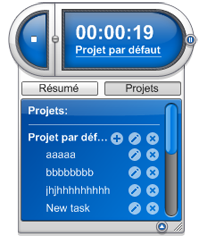 The Widget is made of two main modules: one displays the user's "to-do" tasks and todays' event, while the other displays a calendar where the user can add new events. The iCalendar format is fully supported, including support for recurrent events, exceptions and alarms. It can also export and import events from / to Google Calendar. Tools: Yahoo! Widget Engine, Photoshop and SQLite to store the events. Cinematrix enables pupils and teachers to mix music and video in real time. It is possible to mix twenty channels of audio and video in real time, using pre-installed files. A pupil can also easily capture and load in their videos, photos and music to create documentaries, presentations and music videos. 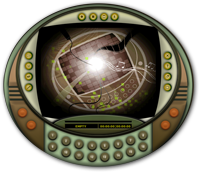 Role: Implemented and designed 3 Cinematrix tools: a video and music editor; a video capture tool; and an audio recording tool. Tools: Adobe Director; Photoshop; .NET / C#; Quicktime Pro to edit and compress video files; Installer Vise. Video game demo to experiment with interactive camera systems. Role: Implemented the game engine and game editor. Designed the 3D objects and textures. Tools: Adobe Director, 3D Studio Max, Max Script (for the game editor), C++ (for the development of three additional Director Xtras) and Photoshop (texture design and user interface).